StoneLok™ "MLT Plus" Sealer manufactured by Richard James Specialty Chemical Corp is a waterborne sealer made from minute particle-size polymers that penetrate tight surface matrices and bond perfectly with RJSC epoxies for superb protection against soiling and chemical contamination. StoneLok “MLT Plus” can be used directly over properly prepped concrete, engineered cements, or other cementitious substrates; or as 2nd, or 2nd and 3rd coats following one or two coats of StoneLok “E3” or TK6TM NanoCoat. Under some “at-risk” substrate conditions and typically on countertops, O-S/WTM Substrate Conditioner is recommended prior to application of sealer for increased durability and superior adhesion and performance. For installations that have been unprotected and/or prior treated with wax, sealer, stain and/or cleaning agents, CONTACT RJSC for detailed cleaning and/or concrete prep instructions. Mask as needed. Surface must be dry & dust-free; 7 - 8 pH; >60º F and <80º F.; with no salt residues and no laitance. For Matte and Low Gloss finishes, shake StoneLok containers thoroughly to be sure matting agents are in emulsion. Note: If material has settled out, and matting agents do not go easily into emulsion, pour off half the container and shake again. It may be necessary to strain through a small sieve and then shake thoroughly again. Let foam settle. (Gently swirl container(s) for Gloss). 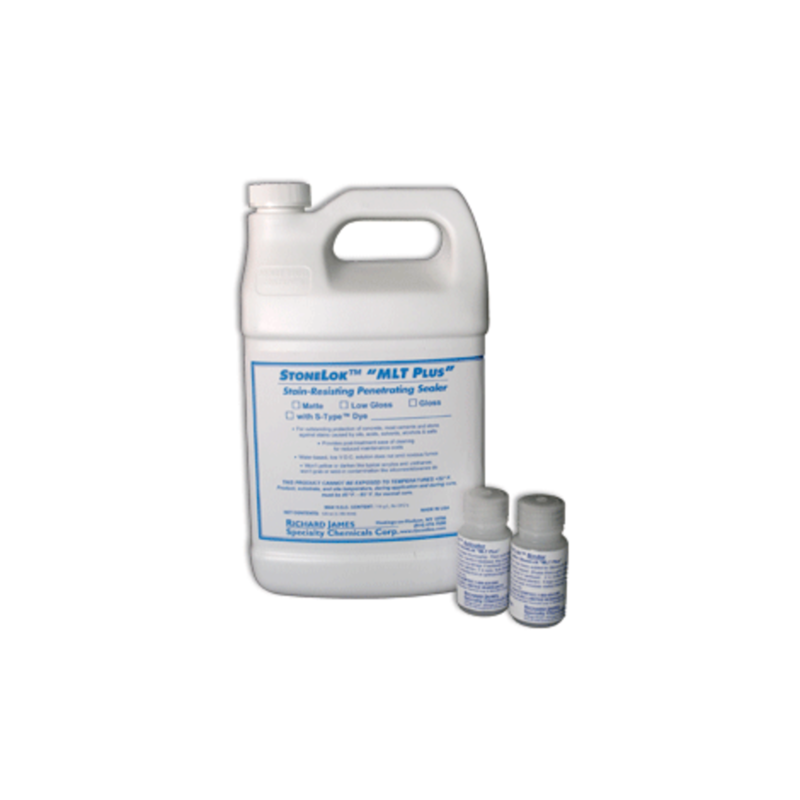 30 minutes prior to use, add 1 small bottle Activator to large bottle MLT PLUS. Shake thoroughly. Then add 1 small bottle Binder. Shake thoroughly again. Note: If you want to use less than a full unit, measure out STONELOK and add 1.7% Activator and shake. Then add 1.7% Binder and shake. Pot life of mixed solution is about 6 hours after induction time, longer if kept in closed container. Apply using HVLP or airless sprayer. Hold sprayer nozzle a consistent 8" - 10" from the surface and work an area about 100 - 300 sq.ft. or as convenient to the layout. Move slowly enough to get the entire surface very wet -- but do not allow STONELOK to "pool". If sprayers are not available, 3/8" or less rollers may be used. Work must be in fast, relatively short, even-pressure strokes to avoid overlap marks. Never apply in straight lines and never pour product onto the raw substrate. Use painter’s technique of “V” or “W” lay down, fast spread, and light backroll. Always works wet to wet. Allow to dry for 2 - 8 hours. If specified, mix, activate, induct and apply 2nd coat as above with maximum amount of product before pooling. Note: Temperature of about 70ºF, good air circulation and low humidity help drying process. The longer between coats, the shorter dry/cure time After the 2nd coat. Do not clean for 48 HOURS. Best cleaning method thereafter is RJSC StoneCleanTM "60", PLUS or "104" in recommended dilution. Never use abrasive pads or aggressive cleaners. Do not put tape on STONELOK-SEALED surface! Do not drag furniture or other sharp objects across sealed substrate! Two coats recommended for most substrates.